Also called Khoya or Mawa, it is the solidified milk that is used for making numerous Indian sweets. It can be made well in advance and kept in the fridge or freezer. You can buy it ready made from most good Indian grocers these days, but home made one is tastier. Two litre full cream milk will make approximately 250 gm. 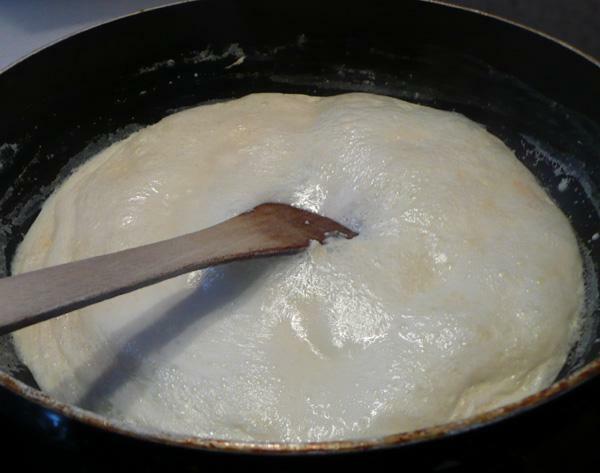 mawa, depending upon the thickness of the milk you are using. 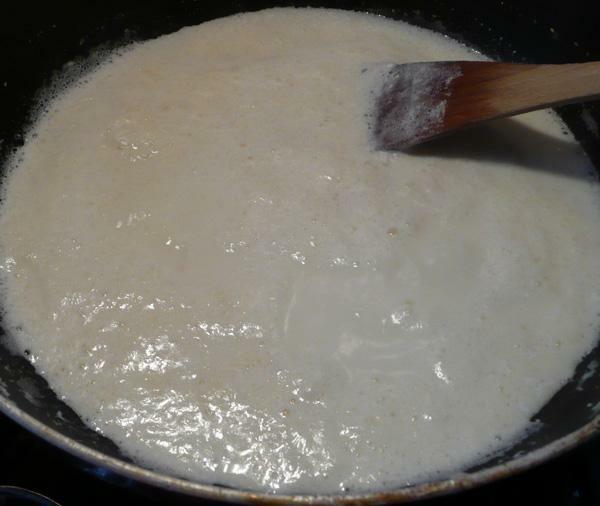 Bring milk to boil in a heavy bottomed pan. Reduce flame to medium and simmer. Continue simmering, stirring very frequently, especially towards the end, when milk has become thick. You must not let it catch/stick at the bottom, or it will burn. Smell of burnt milk is terrible and no good for making anything with. It is good only for the bin! When the milk is almost solid, quite thick, turn the heat off and allow to cool. It will solidify a little more as it cools. If not using immediately, cut in 2-3 portions and freeze, wrapped in a cling film or in a plastic bags. Making Granular Khoya (Danedar Khoya): This is used for making some special sweets like Milk Cake and Kala-kand. Bring the milk to boil. Turn heat down to medium. Add 1/4-1/2 tsp. of lemon juice, a little at a time, until the milk curdles very, very slightly. The whey should not separate. If it does, you have added too much lemon juice. Proceed to make paneer. Continue to simmer until it is almost solid. The resulting khoya is slightly granular. You can use Ricotta cheese, instead of khoya/mawa. Put it in a heavy non stick pan and heat it on low-medium heat, stirring it often intil most of the water has evaporated and then use it as khoya. This tip comes from my sister in-law Padma Gupta of Miami, USA. You can use condensed tinned milk for making sweets too.